We’ve been busy making plans, brewing, cleaning, packaging beer, more cleaning……..
We had just enough time to pick up an award for our Lucky IPA beating off some stiff competition to take a WIN at the Northamptonshire Food & Drink Awards last week. 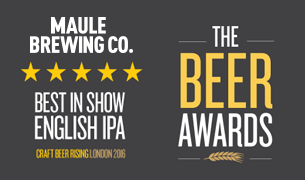 Lucky IPA is racking up the honours with an award @ Craft Beer Rising 2016 ‘Best IPA in Show’ earlier this year. We’re proud to represent local produce and just as proud to push it beyond Northamptonshires borders into the wider world. We’d like to thank everybody that has helped us along the way since Lucky IPA was conceived. People drinking and enjoying our beer is normally all the reward we need, but it’s always nice to receive a prestigious local accolade along the way. So if you haven’t already, make sure you stock up on Lucky IPA and tell all your friends to drink local! It’s one of our core products so will be available hopefully for many years to come.